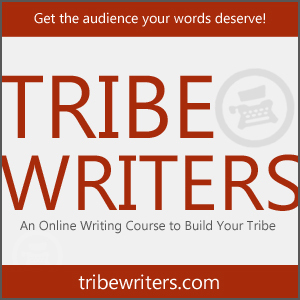 In 2012 I found out about the Tribe Writers course, led by author, entrepreneur and writing coach, Jeff Goins. The course is online, organized in simple modules, and very flexible in design. It can be entirely self-paced or you can track through with the rest of the group (which provides opportunity for peer review and dialog in the writing practice). The course is designed with a mixture of written information (often bullet-point style and easy to digest), directed practice, and audio interviews. As someone who oversees and teaches in an online education program, I can vouch for the legitimacy of the course design. And as someone who loves writing and desires to improve, I can certainly vouch for the content. There are a lot of additional resources provided to participants, such as free downloads, invitations to live webinars, and advance access to books and other material. However, the most valuable piece is something I’m taking advantage of right now (June 2013), once you’re in the course, you’re in…for life. That means the material is always accessible and any time a new course starts you can take it again – with additional and updated material – FOR FREE! About halfway through my first time in the course, things got really crazy with work and I was unable to continue. However, it wasn’t a big deal, because I knew I could come back in later…and that’s exactly what I’m doing now. Even when I wasn’t actively in a course, on several occasions I’ve taken advantage of the participant forums to share specific pieces of writing for feedback. The course helps you find or hone your “voice,” get feedback, and, perhaps the most valuable piece, strengthen your platform and readership through cultivating a “Tribe.” This involves and information skill development in using social media, and online reading/writing tools, but it is mostly about figuring out who you are writing FOR and who you are writing TO (not necessarily the same) and then focusing your efforts. I cannot recommend this course enough. Whether you are a blogger, a more traditionally published author (or want to be), or just want to improve your communication skills, this course is well worth the time and money you’ll invest. I’m creating this page on June 19, 2013. The course is starting now and registration is only open for a couple weeks. (A new group starts 2 or 3 times a year.) Hopefully you’ll check it out – even if you can’t take the course this time, get in and come back to it later. The cost goes up pretty much every time it’s offered, so it isn’t likely to be this price again. If you come across this page after the registration closes, I hope you’ll still check it out and sign up for email updates which will let you know when it opens again. 48,713 explorations of our site.